Good day! It's Layle with you again today, blogging live from sunny Southern California where we're setting up our booth for the Craft & Hobby Asssociation trade show. Welcome to our Winter 2014 Reveal Day 5! You all deserve a hand for sticking around with us all week, and today you'll be glad you did because I have another new collection to share with you - A Charmed Life. Happy times are here again with Simple Stories’ new A Charmed Life collection. Brilliant shades of blue, bright green, cheery yellow and pops of white create a fresh palette for recording your charming memories. Now that you've seen all of the fresh A Charmed Life products, how about a few A Charmed Life projects before it starts shipping next month? How about a chance to win an A Charmed Life prize pack before you can buy it?!! You have 2 chances to win! Second - PIN TO WIN! Just pin your favorite of the A Charmed Life images in this post, tag your pin with simplestories and A Charmed Life, then leave us a comment on this blog post telling us that we've been pinned and include your Pinterest user name. That's 2 chances to win an A Charmed Life goodie box before you can buy it! And because I'm feeling extra generous, how about a 3rd chance?! If you're not a Simple Stories follower on Instagram, now might be a good time to start, I'm just sayin'! I'll be doing random giveaways on Instagram as well throughout the week, so follow us at simplestories_ for a 3rd chance to win! Good luck - we can't wait to hear what you think about A Charmed Life! And remember, there's still one more day tomorrow before we wrap up our Winter 2014 Reveal Week, so I'll see you back here again tomorrow bright and early for Day 6! LOVE LOVE LOVE this collection. Did I mention that I love it?!! Some of my favorite color combos in one collection-I can't wait until this is available! The emerald green and navy in this collection together are really amazing! love the green and blue. Hope you are having fun setting up your booth! Stop with the cuteness! I love navy, green, and yellow together so this is a must-have. I love the color combo and the patterned paper patterns. This collection will be perfect for scrapping my vacation photos from Brazil! Love the colours. Thanks for the chance to win! This has got to be among my favourite color combos! Great collection! Love the color combo and the designer projects!!! These colors are awesome. The is a great collection. Love love love this collection!! LOVING the colors!!!!! love the color combo fantastic!!!!! This collection is the best! I love everything about it. Perfect for scrapping all ages & stages. I just love this collection!! The colors are awesome, but I completely adore all the little sayings! I must have it all! Sweet!! I love the colors especially the blue, green, and pop of yellow! This will be a must have collection for me! This is too pretty for words. Love the colour combo and the stunning mix of florals and stripes and hearts and polka dots... Just gorgeous. So hope to win this lovely! Keeping my fingers crossed! Love this collection! The colors are great! I am going to go broke buying all of your fabulous new collections! I like the color palette and it's not just for St. Patrick's Day. Oh my gosh! Another amazing collection. Great job! Just an awesome, colorful, versatile collection. This Charmed Life line belongs in everyone's stash. Really great job Simple Stories. Love it! It will play nicely with other product I already own. This is devine! I love the colors and designs!!! TFS! blue and green and yellow is one of my fav color combinations! love it! I just love the colors in this one! Great collection! Nice patterns and the plain coloured sheets are perfect staples for my stash. This collection is so "springy". I love the Instasquares. Oh my, I'm seriously smitten by these beautiful and happy papers! I like the pretty colour combo! Love this collection, it's wonderful to have sweet papers like this that aren't pink/purple sometimes. I can easily use this for boy or girl layouts! Wow! The colors here are really great! I love the blue/green combo! The papers are so pretty and I love that they come in the 6 x 6 pad! SS is quickly becoming my fave line….i was considering joining a kit club, but with all these new options, I don't think I'll have to! Oh my! Love the bright, vibrant colors of Charmed Life. Seriously, there isn't a line from Simple Stories that I don't want to buy! I love the color combination of this kit! My favorite color is green. I could have a lot of fun with this collection. love the color palette! The cut outs and the tiny squares are my favorites! I love this! I have enjoyed all the peeks this week! I think this is my FAVORITE!!!!!! I love it !! These colors are great !! I love the color combo! Awesome collection! This is probably my favorite of all the releases. I love the color combinations! Love the colours....perfect for such a wide range of pages. Love the kelly green mixed with the blues and yellow. Just lovely. What a lovely collection! Just look at those colors! Love Love Love the green in this collection ! It looks great with the navy blue. Lovely ! Love the navy and kelly green combo! Finally, a set I can use for my boys! No kore will they be surrounded by everything pink! Perfect color combination! I think this is my fave!!!!!!!!!!! My 10 year old granddaughter and I were drawn to the beautiful color combination. The Charmed Collection is so pretty, fun, and oh...the creating crafy posibilities. What a cute collection.. I am in love! Love the colours, a great versatile palette! Love the collection!! Love the colours! Love the designs and the fresh color palette! These colors make me so wish for springtime! Thank you for the chance to win! Love the papers and colors in this super cute line! 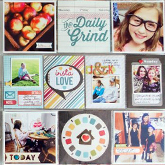 I pinned it to my scrapbooking board - love it!! This is a fantastic collection. I love the clean but bright/fun colors - it will work with everything! LOVE the layout and the colors of this collection. Another great collection. Love the colors you used. Thanks for the chance to win it before you can buy it. I just love the colors in this collection as well as the cute icon used throughout! LOVE the colors! It's all so fabulous! This collection is very charming!!! I love it!! I cannot believe how much I love this collection - my bedroom is mainly this color scheme!! Terrifically done - you guys just keep topping yourselves!!! There's a lot to love in this collection! Absolutely love the colors, particularly the gorgeous blue, in this line! oh how l love the colors on this! I have 2 boys and 1 girl and I love that it would work for all of them! great great great! oooohhhh so in love with the blue, green and yellow in this line!